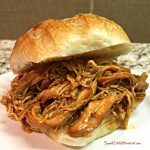 Today’s recipe is one you’ll want to add to your recipe box – Slow Cooker Barbecue Beef Sandwiches! Simple to make, so good. The best ever! 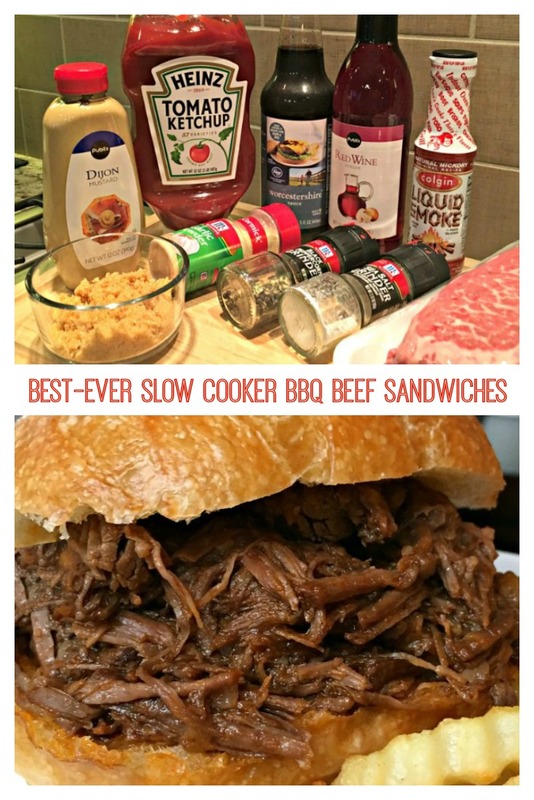 BEST-EVER SLOW COOKER BBQ BEEF SANDWICHES – This fantastic, easy to make barbecue beef recipe is made with a chuck roast that’s slow cooked in a homemade tangy, zesty sauce. 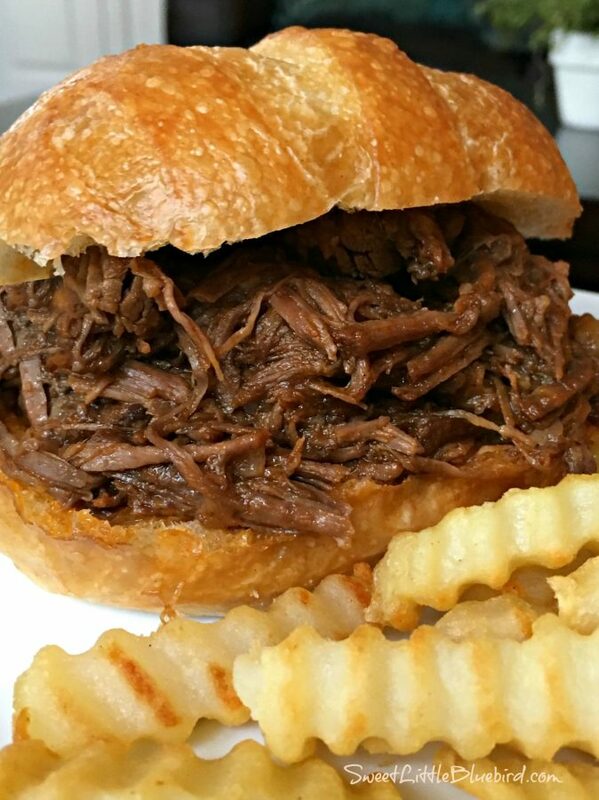 It takes just minutes to whip together, allowing your slow cooker to do most of the work, delivering the most tender, flavorful barbecue beef sandwiches! Perfect for a busy day, game day, parties, potlucks and more. 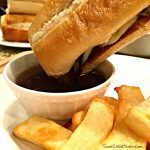 Slow Cooker BBQ Beef Sandwiches to the rescue! School started in our neck of the woods of Georgia last week. I made these BBQ Beef Sandwiches for our youngest daughter’s first day of school. I haven’t made this recipe in years. Our oldest is not a big fan of beef, so I didn’t make a lot of beef dishes when she was in high school. Now that she’s away at college, beef is back in the house. And because it’s August in Georgia and hot as you know what, my slow cooker has been working overtime, rescuing me from a hot kitchen. I’ve been making all my greatest hits (see list below), allowing me to make great meals in a cool kitchen. 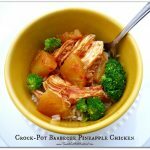 I’m so glad I stumbled on this oldie but goodie in my recipe box, it’s officially back on regular rotation! Chuck roast, ketchup, Dijon mustard, Worcestershire sauce, red wine vinegar, liquid smoke, brown sugar, garlic powder, salt & pepper. What I love about this recipe, it’s so darn easy! Simply spray your slow cooker with non-stick cooking spray, place roast in cooker. Mix the remaining ingredients in a bowl and pour over beef. Cook on low for 8 hours or on high for 4- 5 hours. When beef is ready, remove, cut into thin slices and place back in cooker for an additional 25-30 minutes on low until heated through. Done. Serve on your favorite roll/bun and listen for the “oh, wow, this is so good.” And you’ll never hear complaints about serving this as leftovers, this is even better the next day. Note: I got this recipe from a friend when we lived in Ohio, so I am not sure where it’s originally from (I like to credit the original source). The same recipe can be found on Taste of Home and Allrecipes. 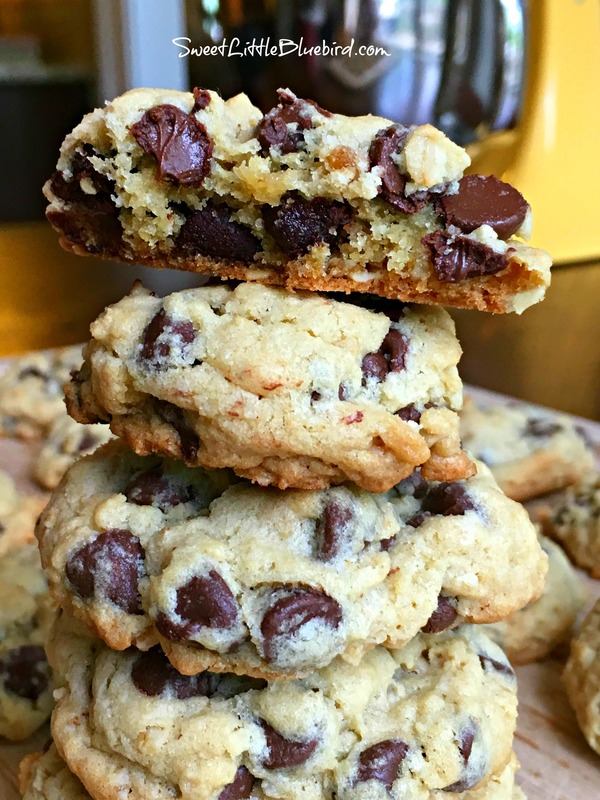 Be sure to read the rave reviews, this oldie but goodie recipe is a keeper! 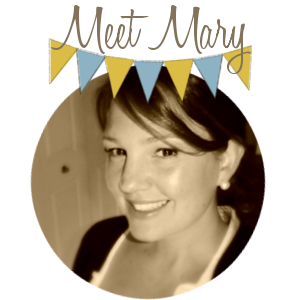 Spray slow cooker with non-stick cooking spray then place roast in cooker. 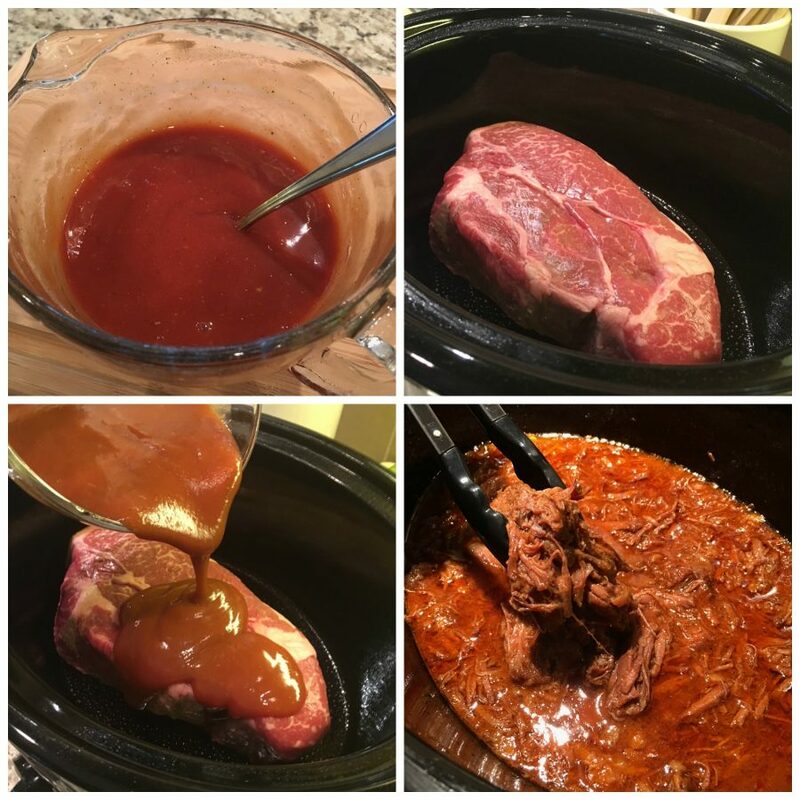 In a medium size bowl, mix the remaining ingredients – ketchup, brown sugar, Worcestershire, Dijon mustard, liquid smoke, red wine vinegar, garlic powder, pepper and salt, mix well and pour over roast. 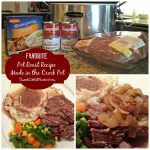 Cook on low for 8 hours or high for 4-5 hours (cooking times may vary, adjust time according to your slow cooker). When ready, remove roast from cooker, place on cutting board and cut into thin slices, discarding fat. Next, skim fat from sauce in cooker (sauce will be thin) and discard. 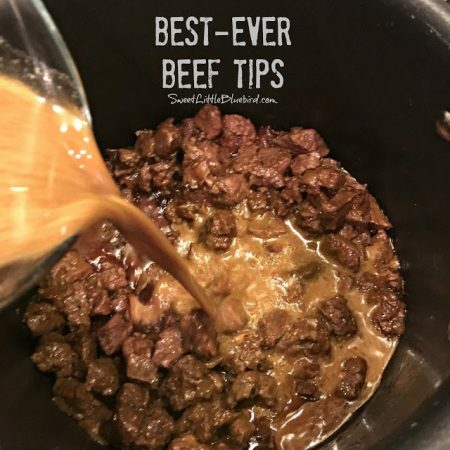 Return sliced beef to cooker with the sauce, stirring and coating beef, then cover and cook on low for an additional 25-30 minutes, until beef is heated through. When ready, use tongs to serve the barbecue beef on rolls/buns. 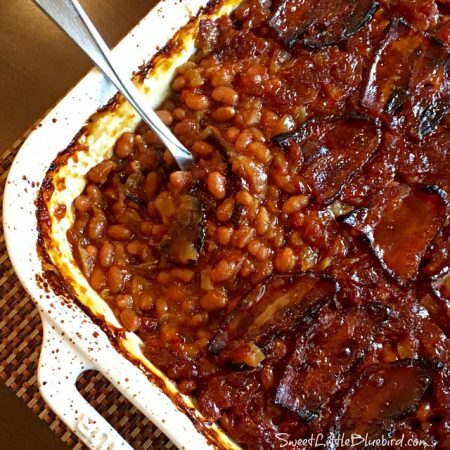 Top with your favorite condiments and serve with your favorite sides – baked beans, coleslaw, potato salad, french fries, veggies and more. I never brown my roast for this recipe, but you can – browning always adds great flavor. To reduce fat, trim the excess fat from your roast before cooking or skim well after cooking. Toast your rolls/buns if you like. I like this barbecue beef as is, no condiments, it’s good on its own. 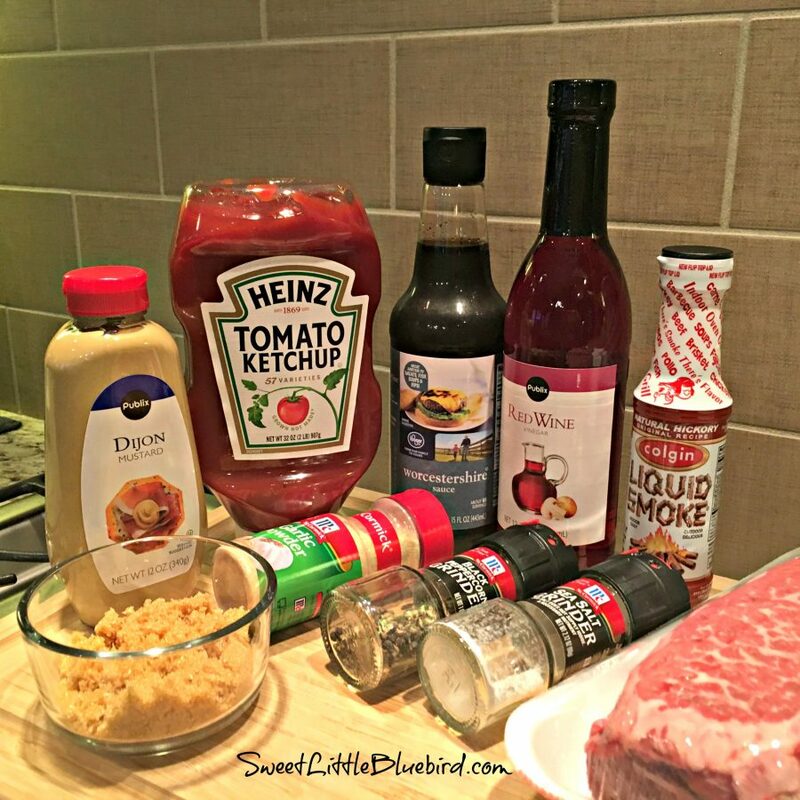 My husband always tops his with his favorite barbecue sauce.